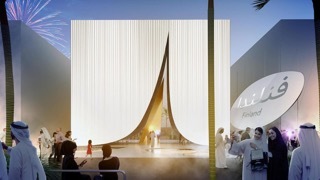 Finland introduced its “Snow Cape” Pavilion for Expo 2020 Dubai. The building is designed by Finnish JKMM Architects and it is inspired by the snow. Finland’s Pavilion incorporates both Finnish and Arabic cultures combining Finnish natural design and innovation with Arabic visual features. The Finnish companies are ready to invest in the World Expo 2020. Participation will strengthen companies’ visibility and image in the Middle East region with significant benefits. The following companies have already confirmed their participation: Kone, Konecranes, Outotec, Fiskars, Nokia, Isku, Finnair, Granlund, Genelec. The exhibition partners include already Business Oulu, Visit Finland -group and Food from Finland -group. There is a promising demand for Finnish solutions in addition to technology products, especially in the areas of IT, smart city technology, bioeconomics, education and healthcare.